Munich. The Capital of Bavaria. International Destination for Ocktoberfest. And perfect excuse for a quick day trip to Europe. If you have only 24 hours to spare, here’s how to spend the most magical day in Munich. As someone who’s been on the road traveling for work (and the occasional fun) for the past six months, I’ve found that the best way to get to know a city is by foot. And the sooner you get a bearing of where things are the easier it for the rest of the time spent there. 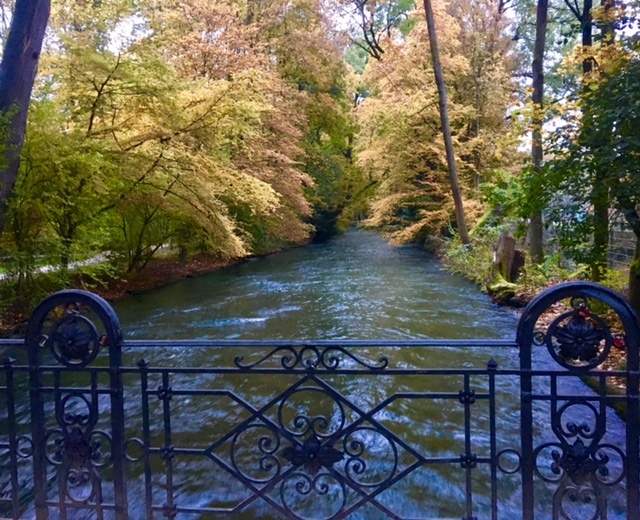 So if you’re wanting to get to know Munich, lace up your walking shoes, prepare yourself for some cobblestone and set off in the direction of one of the city’s many parks with the intention to get lost. 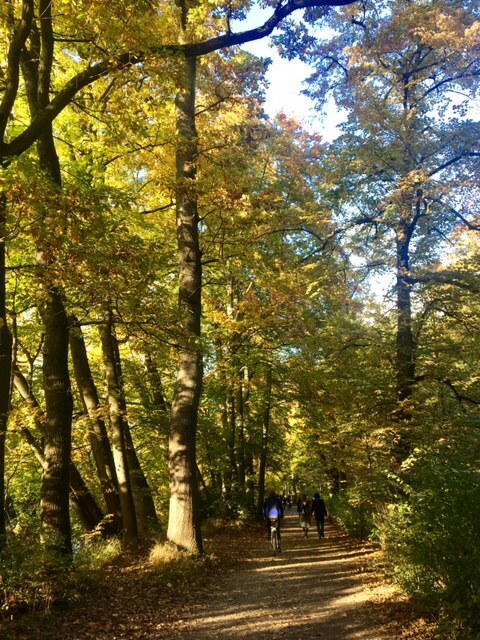 I’m a big fan of getting to know a city by walking and actually went for multiple runs through the city (training for another half marathon) that included the English Garden and Maximilianlagen Park. 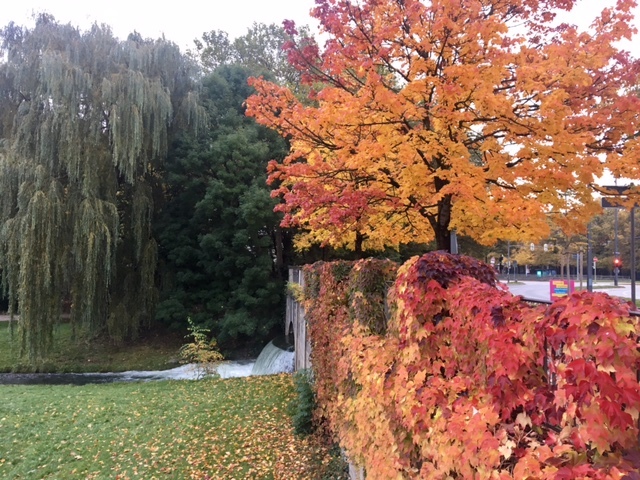 First off, the fall colors are out of this world. And I was a total Texan-who-never-sees-fall fan girl to the MAX. I took probably 600 pictures of the leaves. I don’t care how basic I was, it was gorgeous. You get beautiful river views with the Bavarian rooftops of nearby buildings peaking over the trees. Also, you get to see surfers! Yep. 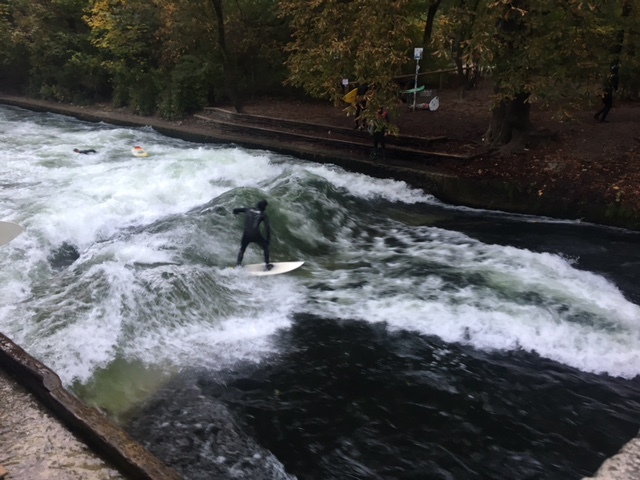 German surfers wake up at the crack of dawn and surf on the river in the English Garden. It’s a must see for sure. 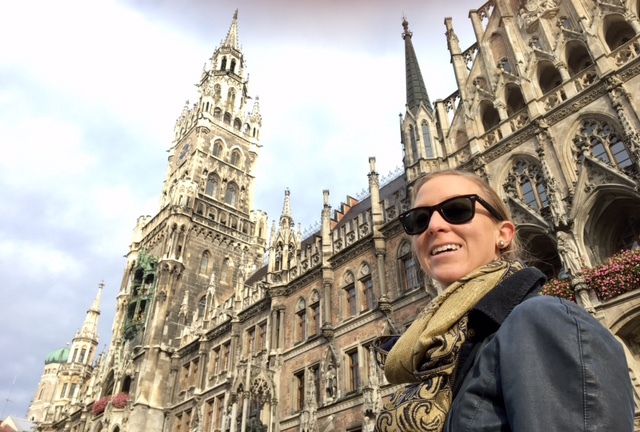 Make your way over into Marienplatz to hear the bells ring on the famous old town hall. 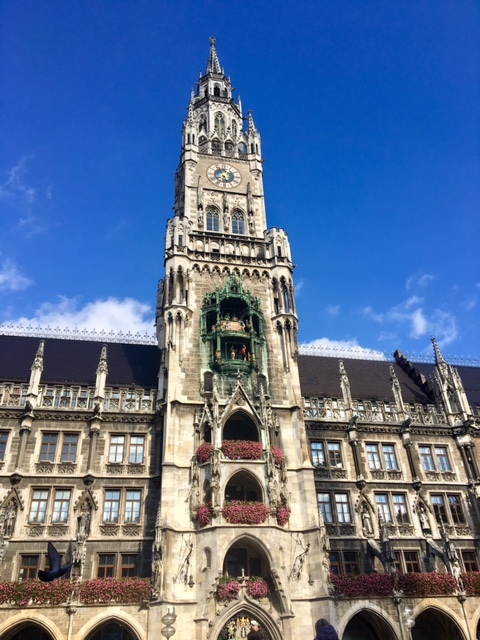 The Glockenspiel (think a giant life size cuckoo clock) rings at 11am, 12pm and 5pm. 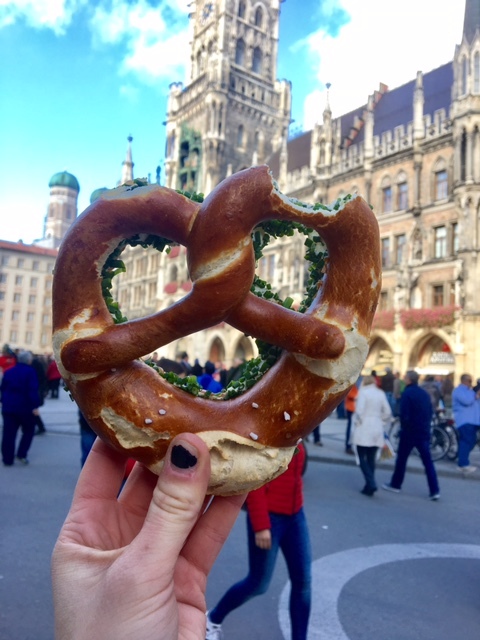 This plaza is a great place to pick up a tour to mix a little Munich history into your day. There is a visitors center in the Plaza that offers walking and biking tours around the city that leave daily at 10am and 5pm. The prices are reasonable (10-25 Euros) and the tour guides are knowledgeable (plus speak perfect English). As Munich was the birthplace of Nazims, i was deciding between the Third Reich tour of “Hitler’s Munich” and the Dachau Memorial Tour. I elected to go to Dachau (tour lasted from 10am-3pm). The site wasn’t as horrifying as I had expected–most of the building had been torn down and those that were left were stripped of most everything. But it was still a pretty sobering experience and I didn’t take any pictures because it didn’t feel right. If you’re into shopping, the city center has a zillion stores that you can check out. 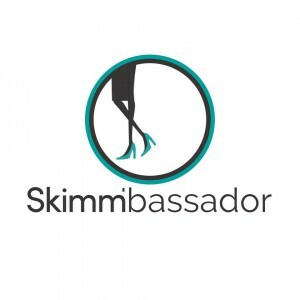 I recommend Primemark and Reserved (European favorites that don’t exist in the states) and Steindl Trachten (a department store entirely dedicated to lederhosen!). 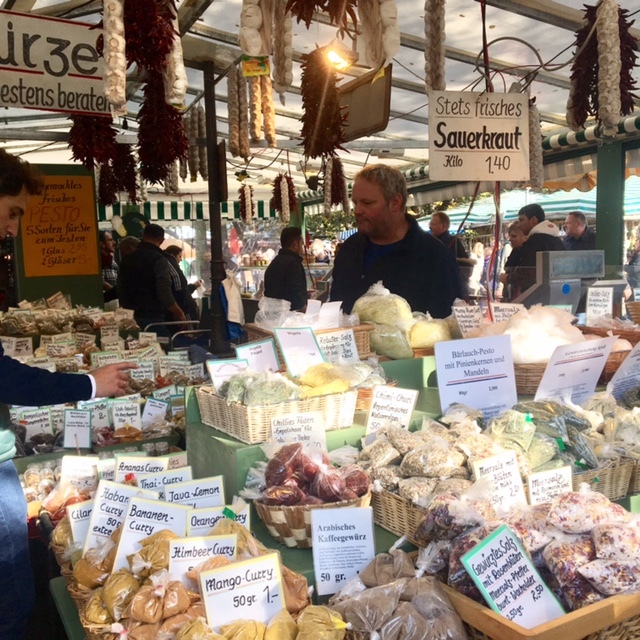 If you’re a foodie, hit up the Viktualienmarkt a few blocks away. Nibble on cheese, bread, sauces, pastas, and juice in the outdoor market. Pick up some fresh flowers, enjoy a beer out in the garden (the line is long!) or window shop through all the tents. Be sure to grab a pretzel at some point. 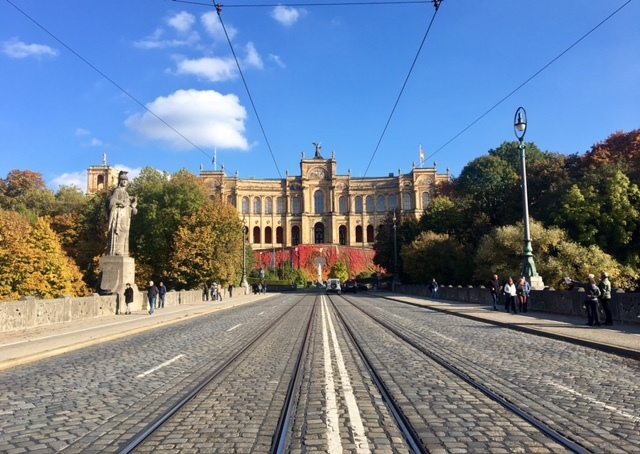 You’re in the capital of Bavaria–it’d almost be a crime not to! Beer. Lager. Nuff said. Hit the world famous Hofbrauhaus or any of other Bavarian beer houses for an authentically German experience. Bavarian culture is all about eating family style and sharing tables. You typically seat yourself wherever there is space (no such thing as a hostess in Germany), and I mean wherever there is space. 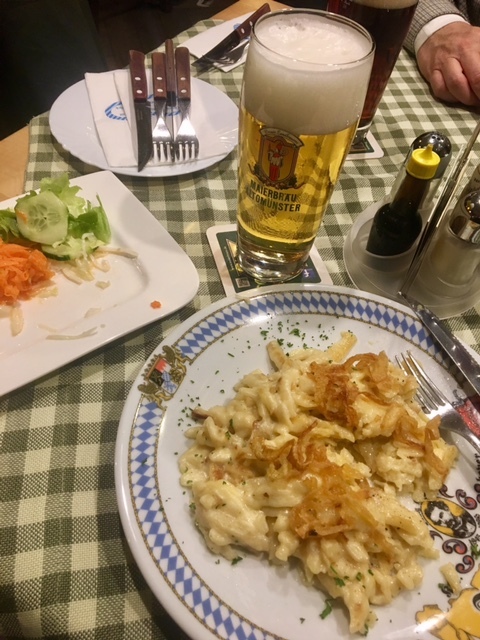 A bustling waitress in a traditional dirndl dress saved me from my awkwardness in the doorway and pointed to a table for two with one seat occupied by a man finishing up his meal. I grabbed the seat placed an order for beer and spatezl (German version of mac and cheese!!!) and chatted with him for a few minutes while he paid his bill. Once he left, my food arrived as did another solo diner who took the seat in front of me. It sounds super strange to have eaten my dinner with perfect strangers, but the sense of community was so genuine the experience was a gem on my whole Munich experience. Most places in Europe take credit cards but if you’re looking to buy a souvenir off the street you best get yourself some euros. Since US credit cards don’t have pins (like a debit card does), you may find that your card gets rejected at certain places –like public transportation. Train stations reject non-pin credit cards and sometimes only take coins with exact change. If you’re in a hurry make sure you have a bunch of coins to ensure that you don’t miss your train. Don’t by souvenirs that were made in Japan. Be wary of cheap imitations in the touristy shops). 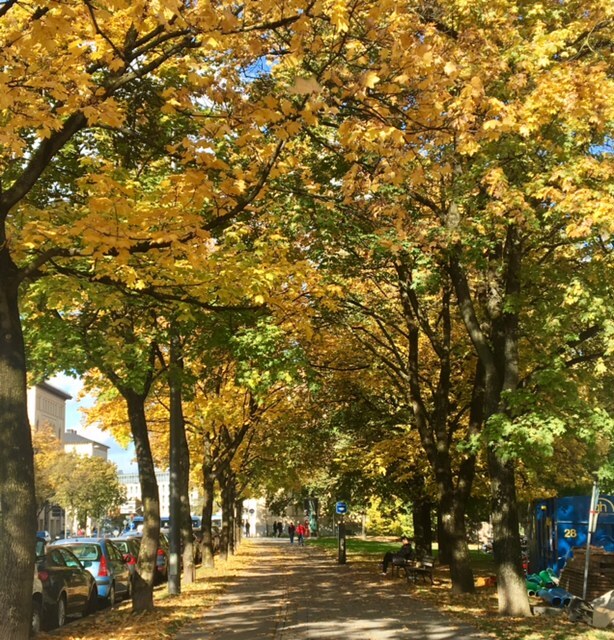 Tags: autumn, Bavaria, beer, Dachau, English Garden, Europe, fall, Germany, lederhosen, Marienplatz, Munich, spatzel, travel, wanderlust. Bookmark the permalink. This is perfect, as I will have 20 hrs in Munich in May! And I agree about best way to explore is by walking the city! I was thinking of getting the hop on and off tour though… Just to kind of see everything and then decide where to go. What’s the best area to stay in? I booked Arthotel ANA Diva since its close to the train station that goes to the airport. What did you use for airport transfer?